On the Fifth of the month of agrahAYaNa, in the bengali year 1410, (৫ই অগ্রহায়ণ, ১৪১০) we plan to get married at the Sri Venkateshwara temple (Balaji Mandir) at 780 Old Farm Road, Bridgewater, NJ 08807-1264 at 12:30 pm. You can check my web page about the Bengali calendar, but suffice it to say that translates to the 22nd of November, 2003 of the Common Era; it is the Saturday before Thanksgiving this year. On this page, we will try to answer some commonly asked questions. Since the Bengali (বাংলা) sounds are difficult to transliterate accurately in the Roman script, the Bengali spellings are often given in parenthesis, and the page is encoded in UTF-8. Even though this encodes the international standard unicode for representing various scripts, it is not yet completely on many platforms. See this page for more information. Please contact us at tanmoy@mindspring.com or kumkumg5@yahoo.com for information not covered here. We are Tanmoy, son of Arati and Mani Gopal Bhattacharya and Kumkum, daughter of Gaurirani and Vaidyanath Ganguly. Even though in our patriarchal society the husband's name usually precedes the wife's in formal lists, it is said that পিতুরপ্যধিকা মাতা গর্ভধারণপোষণাত্‌ (The mother is greater than even the father for support and nourishment in the womb). Accordingly, here we list our mothers' names first. We both belong to the same endogamous unit: the brahmin caste, and, according to tradition, descendants of the same Vedagarbha (বেদগর্ভ). That means we are in the same exogamous unit: Savarna gotra (সাবর্ণ গোত্র) with Bhrigu (ভৃগু), Chyavan (চ্যবণ), Apluvana (আপ্লুবাণ), Aurva (ঔর্ব্ব), and Jamadagni (জামদগ্নি) as our pravara (গোত্র প্রবর). Both Kumkum's and Tanmoy's family descend from (in the patrlineal sense) from brahmins living in Vikrampur (বিক্রমপুর) a few hundred years ago. Kumkum's ancestors moved to a place near Calcutta about a hundred and fifty years ago, whereas Tanmoy's ancestors had settled in Modakathi (মোড়াকাঠী). Some details of Tanmoy's family history are available. Currently Tanmoy is a staff member in the T-8 Group at Los Alamos, and Kumkum is in a postdoctoral position at IFEM at the University of Pennsylvania. What are all these pictures scatterred around this page? The syllable Om (ওঁ) probably was meant as an assent, cognate with Amen, in its earliest usage, but was in later periods mysticized and reinterpreted as a particle that recollected the hindu trinity—the sounds a (অ) for the protector Visnu (বিষ্ণু), u (উ) for the destroyer Shiva (শিব), and m (ম্‌ ) for the creator Brahma (ব্রহ্মা). The sound is considered deep and holy and accompanies recitations from the oldest texts, the Vedas (বেদ), in the religion. 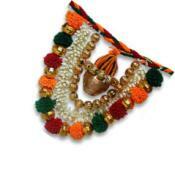 Garlands made of flowers and beads, and other bead designs, are very old tradition in India. Flowers are considered auspicious to Gods, and accompany almost every religious ceremony. A similar statement can be made for earthen pots: they hold the divine waters and are essential to establishing a seat for the Gods. These symbols probably predate the Indo-european influence on the Indian religious landscape. What does the Bengali part of the invitation say? gathering organized for this occasion is our sincere desire. Please excuse the fault of invitation by letter. As an integral part of high marriage tradition, we are introduced by at least seven male ancestors of our fathers and five of our mothers. Accordingly, Tanmoy (তন্ময়) is son of Mani Gopal (মনিগোপাল) son of Yaminikanta (যামিনীকান্ত) son of Vanamali Smritiratna (বনমালী স্মৃতিরত্ন) son of Gaurinath Tarkavagish (গৌরীনাথ তর্কবাগীশ) son of Shambhunath Vidyalankar (শম্ভুনাথ বিদ্যালঙ্কার) son of Ramarudra Siddhanta (রামরুদ্র সিদ্ধান্ত) son of Ramgopal (রামগোপাল) son of Gangaram (গঙ্গারাম) son of Ramgovinda Vidyalankar (রামগোবিন্দ বিদ্যালঙ্কার) son of Ramjeevan (রামজীবন) son of Raghunath Sarvabhauma (রঘুনাথ সার্ব্বভৌম), who may have been the first to obtain the title Bhattacharya (ভট্টাচার্য্য) in our family. Tanmoy's mother Arati (আরতি) is daughter of Dhiren (ধীরেণ) son of Kaminikumar (কামিনীকুমার) son of Chandrakumar (চন্দ্রকুমার) son of Ratnakrishna (রত্নকৃষ্ণ) son of Ramkishor (রামকিশোর) son of Rameshvar (রামেশ্বর) son of Kalikaprasad (কালিকাপ্রসাদ) son of Hariprasad (হরিপ্রসাদ) son of Gauriprasad (গৌরীপ্রসাদ) son of Krishnadev Nyayalankar (কৃষ্ণদেব ন্যায়ালঙ্কার) son of Ramkanta Vachaspati (রামকান্ত বাচষ্পতি). Kumkum (কুমকুম) is daughter of Vaidyanath (বৈদ্যনাথ) son of Gopalchandra (গোপালচন্দ্র) son of Nandalal (নন্দলাল) son of Kedarnath (কেদারনাথ) son of Ramkanai (রামকানাই) son of Ramram (রামরাম) son of Rajaram (রাজারাম) son of Ramgovinda (রামগোবিন্দ) son of Ramakrishna (রামকৃষ্ণ) son of Vishvanath (বিশ্বনাথ) son of Janakinath (জানকিনাথ). Kumkum's mother Gourirani (গৌরীরানী) is daughter of Akkhay Kumar Mukherji (অক্ষয় কুমার মুখার্জ্জী).